Reed Bunting (Emberiza schoeniclus). Male, summer plumage. Taken at Otmoor, Oxon., on March 26th 2014. Male, summer plumage. Taken at Otmoor, Oxon., on March 26th 2014. Reed Bunting (Emberiza schoeniclus). Male, winter plumage. Taken at Farmoor, Oxon., on December 26th 2017. Male, winter plumage. Taken at Farmoor, Oxon., on December 26th 2017. Reed Bunting (Emberiza schoeniclus). Female. Taken at Otmoor, Oxon., on February 4th 2017. Female. Taken at Otmoor, Oxon., on February 4th 2017. 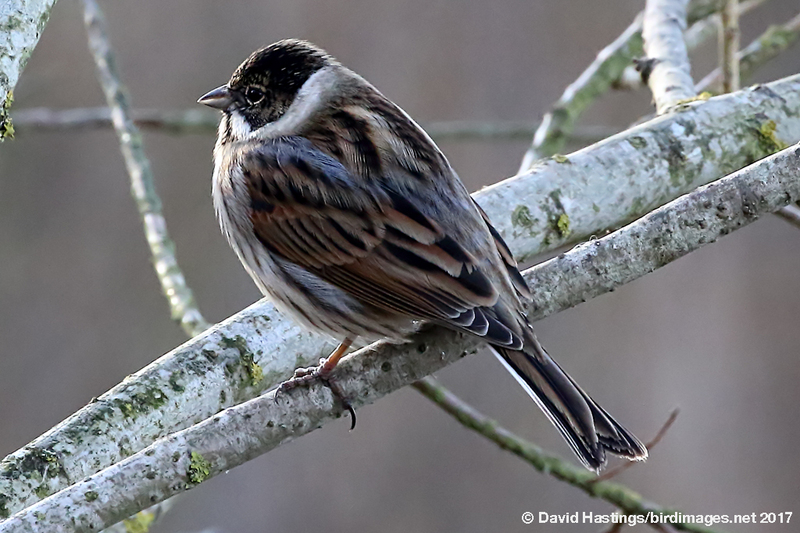 Sparrow-sized but slim and with a long, deeply notched tail, the summer male Reed Bunting has a black head, white collar and a drooping "moustache". Females and winter males have streaked heads. In flight the tail looks black with broad, white edges. 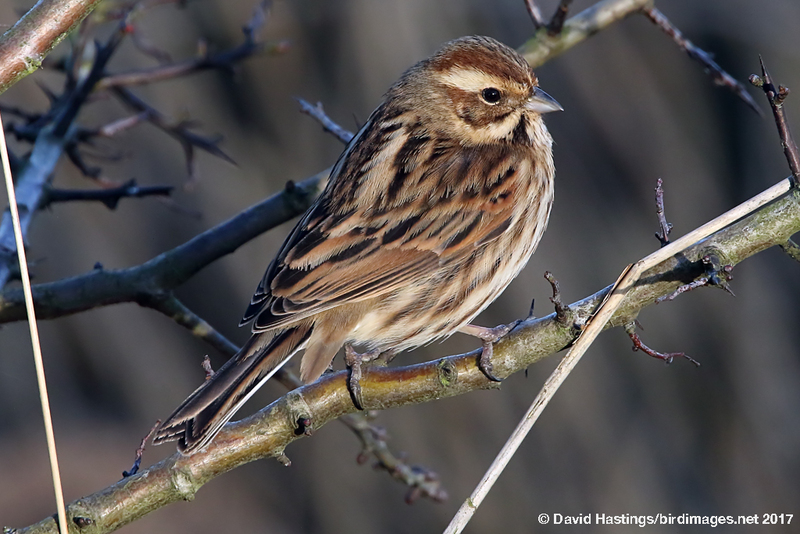 Reed Buntings are found in most of the British Isles, excluding the Scottish mountains. They breed in tall rushes, reedbeds and shrubbery on wet ground at lake margins, as well as drier sites. 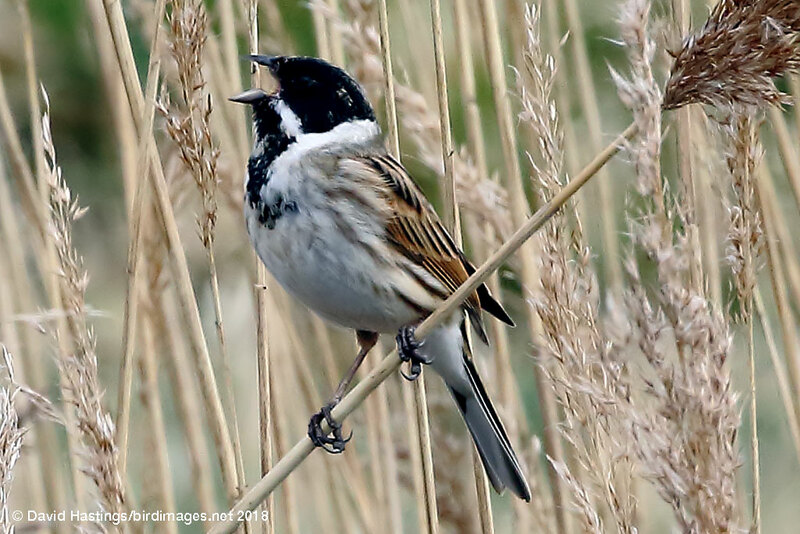 Over 50% of Reed Bunting chicks are not fathered by the pair male but are the result of an adulterous liaison, the highest recorded rate of any bird. It is listed as Amber on the British list. There are about 250000 territories in the UK.